As soon as the temperature drops, I use it as an excuse to get crocked….with my Crock-Pot that is. I used to think that cooking winter root vegetables was difficult, but not anymore. Follow my fool-proof recipe below to make a vegetable stew this time of year. You will need 2 pounds of carrots, rutabagas and parsnips for the core of the dish. The recipe also calls for ½ cup of chopped parsley, 3 tablespoons of olive oil, along with salt, pepper and basil, to taste. To keep this stew full of flavor, you will also need ½ cup of chicken stock, a can of fire roasted tomatoes and 2 tablespoons of tomato paste. Peel all of your vegetables, and cut into 2-inch chunks. Chop the parsley, and put all the vegetables into your Crock-Pot, and add the olive oil, basil, salt, and pepper. If you like a little kick with your stew, add in a tablespoon of hot sauce. Make sure all the vegetables are coated evenly, and add the chicken stock and tomatoes. Cover and cook on low for 8 hours. If you are pressed for time, you can set the Crock-Pot to high and cook for 4-5 hours, but I like to cook it low and slow so all of the vegetables can be easily cut with a fork. 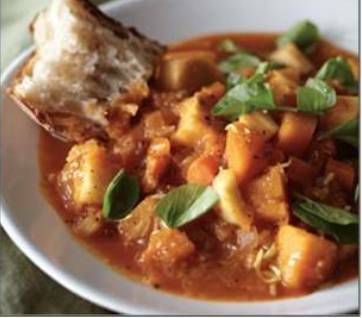 Once the stew is cooked all the way through, serve with some crusty bread and your favorite beverage. Enjoy!